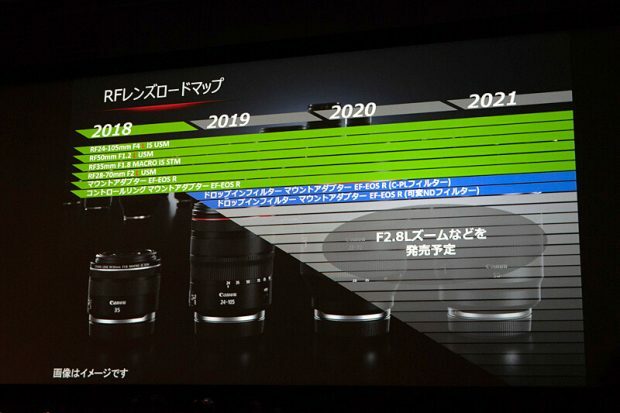 During the launch event of Canon EOS R, Canon officially released the RF mount lens roadmap for Canon EOS R full frame mirrorless camera. You can see this official RF lens roadmap above. Unlike Nikon, Canon didn’t show any upcoming lenses beside 4 already announced RF lenses (RF 28-70mm f/2L, RF 24-105mm f/4L IS, RF 50mm f/1.2L, RF 35mm f/1.8 Macro IS STM) and EF to EOS R lens adapters. They only tells us that they are going to release several f/2.8 zoom lenses in 2019 to 2021. You can see rumored f/2.8 zoom lenses in the previous post. Previous Previous post: Sigma 28mm T1.5, 40mm T1.5, 105mm T1.5 FF Cine Lenses to be Announced Soon ! Next Next post: Firmware Update with News Features will Coming Soon After Canon EOS R Released !